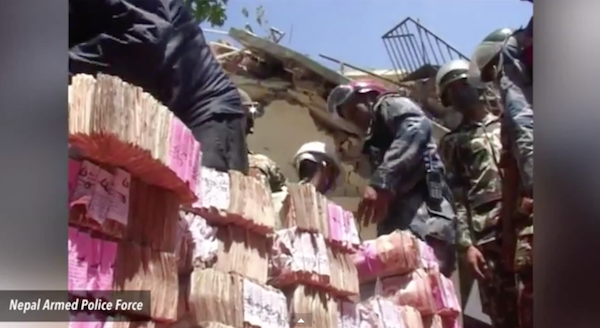 Almost 25 million in local Nepalese rupees have been discovered in the aftermath of the earthquake. The money was found from the rubble of a local bank by a rescue team. According to one report, the amount recovered was around 24.89 million Nepalese rupees which is nearly $245,000 in U.S. dollars. Smaller amounts of U.S. and Thai currency were also located. The team, composed of members from the Armed Police Force and Nepal Army, were sent to the Balaju branch of the Bank of Kathmandu after bank officials notified police about the money. The cash was reportedly found in a safe deposit box and was ultimately released to bank representatives. The building is one of more than 150,000 that were demolished by the recent 7.8-magnitude earthquake that has so far claimed more than 7,200 lives. Are UK Special Forces Preparing For Chemical Warfare In Iraq? How Our Thoughts Affect Water…. and Us!